Some things you simply can't buy online. Purchasing your glasses from Thomas Vision Clinic guarantees you will always have access to our knowledgeable Opticians to help select the perfect frame for you, expert advice on lens options and free adjustments and repairs. 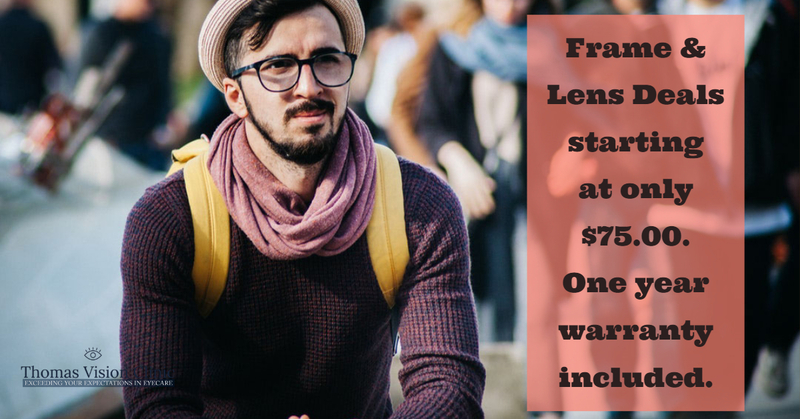 We offer stylish frame & lens packages starting at only $75.00 backed with our exclusive no hassle one year warranty. We offer a 20% Military discount, 10% Senior Citizen discount, 20% off Back-up glasses, 50% off all second pairs when 2 or more pairs of glasses are purchased the same day or 30% off a 2nd pair when purchased within 30 days of your 1st pair. we also honor all VSP plans & discounts.